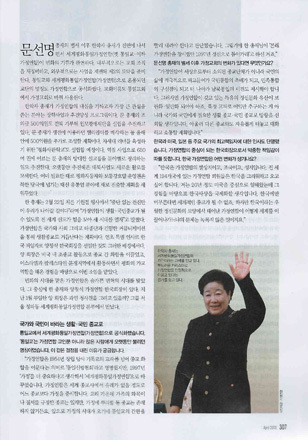 The following is an interview with Dr. Chang Shik Yang, president of Family Federation for World Peace and Unification, by Eun Young Baek, a staff reporter at Joong Ang Ilbo, a Korean monthly magazine. The article is titled “Lead World Peace as a People’s Life Religion,” is to be published in print on April 1, 2013. Eun Young Baek: What is the difference for Family Federation for World Peace and Unification (FWPU or Family Federation) after the ascension of the founder, Rev. Sun Myung Moon? EYB: Family Federation changed its leadership in the main nations such as Korea, the United States, and Japan, etc. As a president of the Korean church that serves as the center for the Family Federation, I think you must have a sense of heavy responsibility. What kind of change will FFWPU-Korea experience? EYB: After Rev. Moon’s passing, there is one viewpoint that Dr. Hak Ja Han, [his widow], is showing good and stable leadership. On the other hand, some people are playing “wait and see” because of the problems that need to be solved. EYB: The Korean news reported that Chairman Sang Kwon Park met key members of North Korea such as Mr. Thae Bok Choe, chairman and deputy of the Supreme People’s Assembly (SPA); and Mr. Ki Nam Kim, the Information Secretary of the North Korean Workers’ Party, after North Korea’s nuclear test. The meeting was six days long and started on February 13, 2013. At this meeting, there were lots of different interpretations. Were the exchanges on a private or a political level? Dr. Yang: “That meeting wasn’t on apolitical level. Even though there are political conflicts, the door should be open for a private channel. Family Federation has been building a trusting relationship with North Korea. That is why Rev. Hyung Jin Moon went to the funeral for Kim Jong Il, the former leader of North Korea. I know Family Federation has a big role in the relationship with North Korea. You can have expectations on that. It is also Dr. Han’s will that non-governmental organizations need to help government to pursue peace. It depends on issues, if there is something we can help, we’d love to help not only as a member of Family Federation but as a private citizens. Chairman Sang Kwon Park brought two dogs from North Korea when he returned. They were gifted from Kim Jong Eun, North Korea’s current president, to Dr. Han. We named them ‘Jungju’ and ‘Anju’ which are names of our founders’ hometowns. EYB: FFWPU showed amazing diplomacy on Foundation Day. Many global leaders participated in the Foundation Day event. Dr. Yang: “At the ‘2013 World Summit Leaders Assembly’ hosted by Universal Peace Federation, 13 current and seven former heads of state attended and 280 international and 300 Korean religious and political participated and learned about the central idea to unite the nation. At the World Summit Assembly, they discussed defense issues in North East Asia, North Korea’s nuclear issue, racial issues and religious issues, of interest to their nations. Because of that, more than 90 percent in attendance were non-Unification Church leaders, but they still participated in this event. EYB: At the “2013 World Summit Leaders Assembly” they discussed how to implement “Vision 2020” that started on Foundation Day. EYB: Also before the Foundation Day event, the International Joint Wedding was held in Cheong Shim Peace World Center. What meaning does this event have? Dr. Yang: “Under Dr. Han’s officiating, 3,500 couples at the stadium and 8,500 couples from all around the world participated in this Joint Wedding through internet. The International Joint Wedding has been to realize the ‘ideal of true family’ which transcends religion, race, and nation. Also, it is a ceremony wherein husbands and wives commit their vows to love each other and to become a truthful family centered on God. The family has important value because we see the family as a starting point and a base for a world that brings peace and unity. Still, there are lots of people waiting to participate in this event. So, Dr. Han will inherit Rev. Moon’s will and we plan to host the International Joint Wedding event annually. 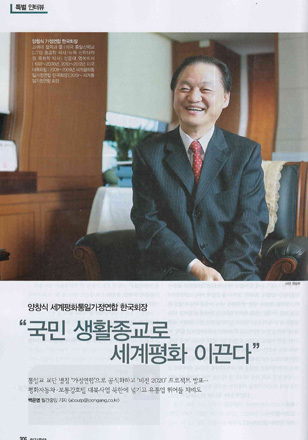 EYB: Dr. Han donated 50 billion won, which is the condolence money for Rev. Moon’s funeral to Wonmo Pyeongae Foundation. What kind of Foundation is this? Translated by Lymhwa Kim and edited by Krista Karjalainen in New York.